ARLINGTON, Texas - The Red Sox have played poorly against the Texas Rangers for the last three seasons, particularly at Rangers Ballpark. It was a disquieting trend that had the potential to become a fatal flaw come the postseason. The Sox downplayed the notion, saying the results were just a snapshot within a long season and nothing to be concerned with. But their actions the last two nights spoke louder. The Sox routed the Rangers again last night, 13-2, as Carl Crawford homered and drove in five runs. A rejuvenated lineup has produced 24 runs on 30 hits, 13 for extra bases, in the last two games. The Sox are alone in first place in the American League East for the first time since Aug. 14 as the Yankees were beaten at home by Oakland. The Sox also are 5-2 on a grueling eight-game road trip that ends tonight. “It feels like we’re getting back on our feet a little now,’’ catcher Jason Varitek said. As was the case Tuesday night, every Sox starter had at least one hit. Jacoby Ellsbury was 3 for 5 with his 23d home run and 35th stolen base. Adrian Gonzalez homered for the third time in the last two games and now has 99 RBIs. Dustin Pedroia had two hits and two RBIs before getting a breather for the last three innings. David Ortiz also made an impact, going 2 for 5 with a double and one RBI after missing nine games with bursitis in his right heel. Ortiz tested his sore foot in the first inning when he scored from first base on a double by Crawford. Third base coach Tim Bogar tried to get Ortiz to stop, but he kept going. 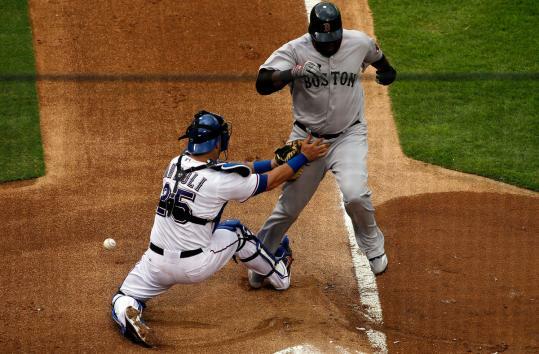 The throw beat Ortiz by several steps but catcher Mike Napoli dropped the ball. “He felt the earthquake coming in,’’ Ortiz said. The Sox scored four runs in the first inning off Matt Harrison (10-9), who gave up seven runs over five innings. Beckett (11-5) went six innings, allowing one run on four hits. He dominated the Rangers, not allowing a hit until Napoli hit a solo homer with two outs in the fourth. Beckett was finished after six innings and 110 pitches on another scorching Texas night. The only real excitement for Beckett came in the fifth inning when Ian Kinsler hit a line drive that came inches from the pitcher’s face before it smacked into his glove. It was an unnerving enough play that plate umpire Dana DeMuth went to the mound to make sure Beckett was OK.
An enjoyable night may have been a significant one for Crawford, whose five RBIs matched his career high. He had a sacrifice fly in the fifth and a two-run homer to straightaway center in the seventh off reliever Darren O’Day. It was perhaps the hardest ball he has hit all season. “You can see what he does. That’s exciting,’’ Francona said. Crawford is 9 for 26 on the trip, hitting safely in all seven games, with two homers and eight RBIs. More than any mechanical adjustment, he is trying simply to swing at better pitches. Crawford also has made some changes in his mechanics, getting his front foot down more quickly, which helps get his hands in position to take a level swing. Even with the adjustments, Crawford’s over-analyzed first season with the Sox is not going to end with glittering statistics. But the team’s success has eased that disappointment. If the Sox play deep into October and he is a valuable contributor, how Crawford hit over the summer will be forgiven, at least by reasonable fans.